Setswana is growing everyday, there are so many things for which we have no names in this language, or have borrowed names from places afar, mainly because those items did not exist for us until post independence. There is a vibrancy to a still expanding, flexible tongue. Ever since I was a little girl I have enjoyed listening to our radio news broadcast in Setswana. Suddenly there would be a need to say a simple (in English) word such as helicopter (in Setswana) and someone would have to mould a phrase that in some way captured a description of a ‘flying thing which takes sudden flight and drops like so’ and the phrase-word ‘sefofane sa thoo-tomo’ was born, relying heavily on onomatopoeia for the bit describing the up and down motion. These new words are beautifully ticklish on my tongue and the idea that anyone writing right now could pull a China Mieville* and create a new language, one that could very well be accepted as part of our future formal language, is very exciting and still the majority of local (read popular) wordfolk write and express themselves primarily in English. University of Botswana lecturer and poet Benjamin Janie speaks two languages, Setswana and English and understands Ikalanga. He gladly acknowledges that there are strong arguments for and against writing in European or foreign languages and writing in African indigenous languages. Although he admits that Setswana writings do not sell as much as English writings he feels that African artists are honor bound to produce works in their own language or at least in both languages and that it is a disgrace to promote foreign languages at the expense of our own. Ngozi Lebogang Chukura (NC) is a writer and artist of Nigerian and Batswana descent. A University of Cape Town print media graduate, she is currently Editor of Lapologa, a lifestyle magazine. Angell Nthoi (AN) is a artist who has been writing, reciting and performing poetry, and verse, for the past seventeen years. He sketches with pen and pencil, and designs with computer programs as well. In addition he produces, records and composes music for other artists, and himself, under mouthofvigilance; a movement for moral regeneration, and cultural integration, through urban arts development. Wame Molefhe (WM) is an award winning short story writer who has a number of co-authored books prescribed for the Botswana school syllabus and her debut solo effort ‘Go Tell the Sun’ a collection of short stories set in Botswana was recently published by South African indie publisher Modjaji. She is widely considered one of that rare breed of Botswana's successful and few fulltime writers. 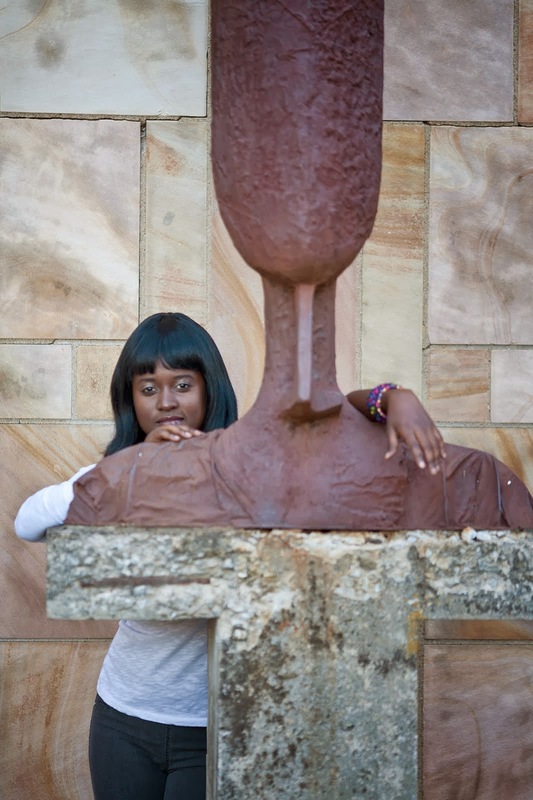 Mandisa Mabuthoe (MM) is a poet, vocalist and artist. She has performed in South Africa, Australia, Botswana and Zimbabwe. She was also a member of Exodus Live Poetry in Gaborone. She is currently working on a theatre production. TJ: How many languages do you speak? AN: fluently, I speak three; iKalanga, Setswana, and English. WM: I speak two languages. I understand bits and pieces of a third and am learning a fourth. TJ: What language(s) did you speak in the home growing up? AN: English. We couldn't speak a word of anything else, until about five years old or so, then, I picked up Setswana off of the streets, by playing with other children who lived in the area. iKalanga came last, learned from my grand parents and other relatives from the homestead, I learned it mostly through listening and watching people as they spoke, and interacted. NC: I spoke English, growing up. TJ: What language where you taught in in school? AN: I write mostly in English, iKalanga, and sometimes, in Setswana, respectively. I've also developed a personal slang i call 'doodle' (made up mostly of comic book terminology and or language, and common slang (particular to old school hip-hop culture.)) which i write in. WM: I write in English, but usually use a few Setswana words and others that might have their origins in other languages, but are commonly used in conversation. TJ: Why do you write in that language? AN: I write in these languages at different times depending on, and in accordance to my state of mind, emotions, time, and space. at times, if not most, i write in English, because, i started writing in English, and find that it is easier to express certain ideas, or execute certain feat or measure in terms of prosody in it, i'm more practiced in it. iKalanga is more personal, and requires more mediation on the subject matter... it takes more time and effort to digest and then deliver. though i can, and have written in Setswana, i usually avoid the language altogether. I feel i sound funny, and have been told that, i have a 'funny' accent. NC: It's(English) the language that i feel most comfortable expressing myself with. WM: I write in this language because I am able to write in it without being weighed down by fear of not saying something the ‘proper’ way. As a writer, I learn by reading other writers. There are many more English texts to select from than there are Setswana. MM: the language I first learned to write and read in is english, I think in setswana as well but I have a wider vocabulary in english. TJ: If you write singularly or primarily in English do you feel pressure to write in other languages? WM:I do not feel pressured to write in other languages. Yes, I have been asked why I don’t write in Setswana and my answer it is my preferred tool for my writing. This does not mean I will never write in Setswana or another language. MM: No pressure, just desire, and I'm a little it envious sometimes of people who can write in all three of my languages. TJ: If you write in a language other than English what difference in terms of media attention and audience/market reaction have you noticed - if any? AN: When I write in iKalanga, the reaction is always the same. no matter how intricate, deep or profoundly simple the subject matter, and or the delivery is. I feel, people in general do not appreciate it. WM: I have not yet tried writing in another language, or at least I have nothing that I want to share with anyone. MM: There's just something beautiful and intense about writing or speaking in a language other than english, people like to hear it, I've seen the audience react as if to say, "wow that was deep"
TJ: In his 2009 article "Who will preserve traditional poetry and song" Gasebalwe Seretse says - Today Botswana has seen a rise in the number of poets, but most of them are 'urban poets' like Seboni and Motlogelwa. Nobody can doubt that the likes of Tjawanga 'TJ' Dema(sic), Lesego Nchunga, Boipelo Seleke and Andreatta Chuma(sic) are doing a great job, but there is need for young people to preserve traditional poetry as it was practised by our forebears in the olden days.- what are your thoughts? AN: to an extent, yes... there is a need for young people to preserve traditional poetry as it was practiced, but the onus is not only on them. most of the young 'urban' poets have shown an interest in their heritage, but, having seen this, the elder folk/ traditional poets have not extended themselves to them, if not rarely, to encourage them, to pass on the torch, as it were. NC: I agree with the statement that we need more people who are interested in indigenous forms of performance and storytelling, but i think it's unfair to expect everyone to express themselves in that way. WM: I believe my culture and tradition help define me as a Motswana. Botswana jwame is that voice that reminds me to greet people I meet, to honour our ways, to address my elders in a certain way. When I say ‘Ke segarona,’ I mean these are my people’s ways. I believe traditions should be passed from parent to child to grandchild and so on. I derive great pleasure from listening to older people and tapping into their knowledge. And I often try and use these things that I learn in my writing. I think the beauty of art, any art, is that it allows artists to express themselves. I know people say: ‘This is not how things were when I was a child.’ I hear myself say those words too but I would not foist the responsibility for the preservation of our ways on our young people. MM: I agree, and there are many, Ntirelang Berman, Keabonye, Gauta, Lucky(Ngwao Putswa - Francistown)... and many more, not only in Gaborone. There is something about the media and the things they choose to notice. im very much in the scene, there is plenty of traditional poetry and songs out there, definately more in english, but hey? if we want more we can and should make more. TJ: Do you think that all literary practitioners are honour bound to act as custodians of their indigenous languages? AN: By appreciating and promoting them, yes... not necessarily through practice, though. NC: No, i do not think so. WM: I think literary works can serve to document and save for posterity a people’s history. There are different ways of doing this. MM: I think all literary practitioners are honour bound to be custodians of who they are and where they come from, tell their story, speak about change where they desire it etc... i definately think they should be encouraged to write and speak in their indigenious languages. TJ: What can every Motswana do to preserve their language from linguistic erosion in this fast globalising world? AN: Put in a petition to revise the national language policy, and push for the recognition of all indigenous languages at all levels. all languages should be placed and used as mediums of instruction, and in office. it all has to start here; at home. NC: Language is alive only when it is spoken; Setswana, SeYeyi, SeKalaka, Xam- whatever language one feels they identify with- can only be preserved if it is spoken and written. That's what i think. WM: Learn your mother tongue. Love it. Speak it. Write. Keep it alive. I do not subscribe to the idea that speaking only English is a sign of ‘cleverness’. I cringe when I deal with a Motswana mother who says her child cannot speak her mother tongue. Go nthaya gore motsadi ga a itlhaloganye. Of course, there may be understandable reasons for this. For example, the child might have grown up in a place where a different language is spoken. I feel sorry for children who are denied the opportunity to learn their mother tongue. MM:start by speaking their languages to their children at home... I have pages of thought on this one, but my thoughts are still raw and unprocessed.